The Pernambuco Healthy Municipalities Network follows the model of PAHO's Healthy Municipalities Initiative. Each municipality pledges to adopt a "healthy action" or a "healthy municipality plan" and to create a cadre of university-trained health promoters. The government is responsible for distributing the network across 23 municipalities. It also offers technical courses on demand, organizes activities, and drafts health plans in a participatory process. 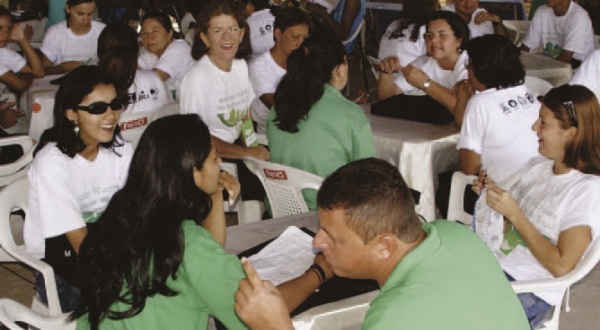 The University of Pernambuco offers courses designed specifically for municipal health promoters. Also referred to as local “intersectoral agents,” these promoters help to ensure that interventions are sustainable. The purpose of the network is to reduce inequalities in health—by fostering equity, social justice, cooperation and a sense of well- being—and to disseminate and promote intersectoral health activities in the participating municipalities. Political commitment. There is political commitment at the highest level of the Pernambuco state government. Separate structure. The network's General Management Committee is comprised of the University of Pernambuco, the State Ministry of Planning and Management (SEPLAG), and municipal representatives (two local managers and civil society representatives). SEPLAG coordinates an intersectoral commission made up of all of the state secretariats. Participation of other sectors. Other sectors besides health participate in the network. It brings together local communities, municipal managers, and municipal health promoters (volunteers with cross- sector training). The network also includes the University of Pernambuco, SEPLAG, and the Intersectoral Commission, along with government social action programs, Health in Schools, other health agencies, arts programs, and planning sectors. Separate budget. The network has its own budget. The state's multi-year budget plan includes allocations for the annual meetings of municipal directors and for regular visits and technical monitoring of local activities. The university has also allocated resources for systematic monitoring and the municipalities make additional contributions as needed. Focus on reducing inequity. The network has a strong gender component. It promotes women's empowerment through domestic violence prevention, training in handicrafts production, the establishment of cooperatives, etc. Intersectoral action. The network's management structure includes representatives from different sectors with the aim of promoting effective public health policy. Regular meetings are held to enhance the network's visibility and provide a forum for intersectoral interaction. The Network's General Management Committee is currently being reactivated with municipal representatives. It operates with a holistic approach at the state and municipal levels. Public policy. The network develops public policies that impact health. There is a focal point for each sector in every municipality. Intersectoral dialogue among institutions such as the University of Pernambuco and SEPLAG facilitates this process. For example, the network develops and implements General Participatory Health Plans at the municipal level that include an intersectoral approach to health promotion. Evidence of results. There is scientific evidence of the results. The network conducts qualitative assessments on quality of life and social capital. An evaluation of the work of municipal health promoters (2008) characterized this initiative as innovative and intersectoral, with documented activities and demonstrated competencies. Other assessments are currently underway with a view to the institutional integration of the strategy. Social participation. The network is premised on active social participation. Following an assessment of social capital, a municipal health promoters program was designed including university certification and support. In Pernambuco , Brazil, they have woven a strong network that involves leaders from the government, university and the community . Everyone collaborates by providing: courses, dissemination, volunteering, and specific plans to make municipalities a healthy experience. Everyone works as a network by meeting, coordinating and acting together. The goal is to develop health equity, social justice, cooperation and the preception of happiness. To facilitate the evaluation of participation. Federal University of Pernambuco and the Ministry of Planning and Management of the State government.